Burlap continues to be a huge hit with farmhouse decor, neutral colors and organic looks being at the forefront to home fashion again this year. 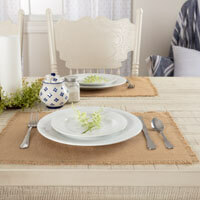 We've put together a style collection of all of our everyday peices that are burlap related. 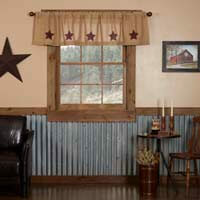 Enjoy burlap must haves in window treatments, bedding, shower curtains and tableware. You would be amazed at the difference just a small change can make with these wonderful pieces. Looking for an update to your bedding but don't want to go too big? Change out your regular bed skirt, shams, toss pillows and pillow cases for burlap. You'll bring new life to your quilt without breaking the bank as well as keeping an interchangeable option when you want a quick something different. From natural burlap to patterns or checks you'll find something you love in our everyday burlap section. We also have great home decor pieces in our seasonal burlap style section offering simple and elegant must haves for decking the halls from ornaments to tree skirts. Click here to shop seasonal burlap. 1 - 12 of 72 Items Displayed.